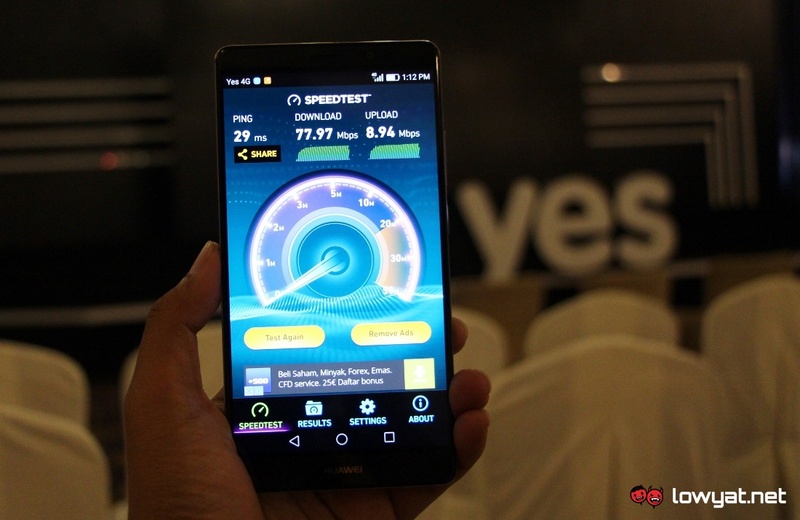 After years of waiting, Yes 4G’s LTE network is finally available for Malaysian consumers. Prior to the big launch event earlier this week though, the telco has actually opened the access to the new network much earlier to customers that purchased any of the three 2016 Samsung J Series smartphones. 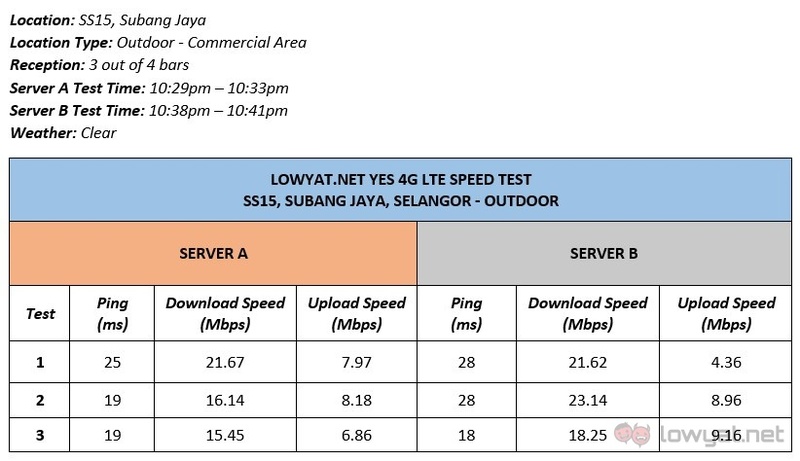 Running on 2300MHz and 2600MHz band, the new network enables Yes 4G to provide 100% LTE connectivity to its customers. 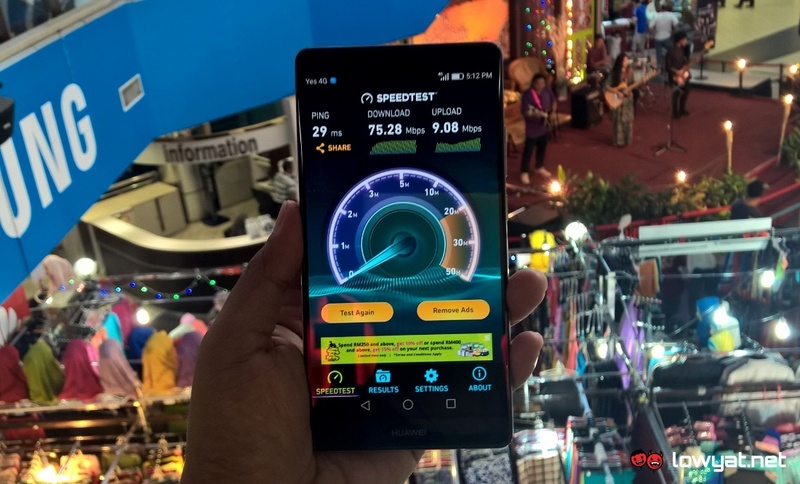 In order words, customers will be able to utilize LTE connection as long as it stays connected to the Yes 4G full-IP network since it is not being backed by HSPA+, HSPA, 3G, or 2G network as per other telcos out there. 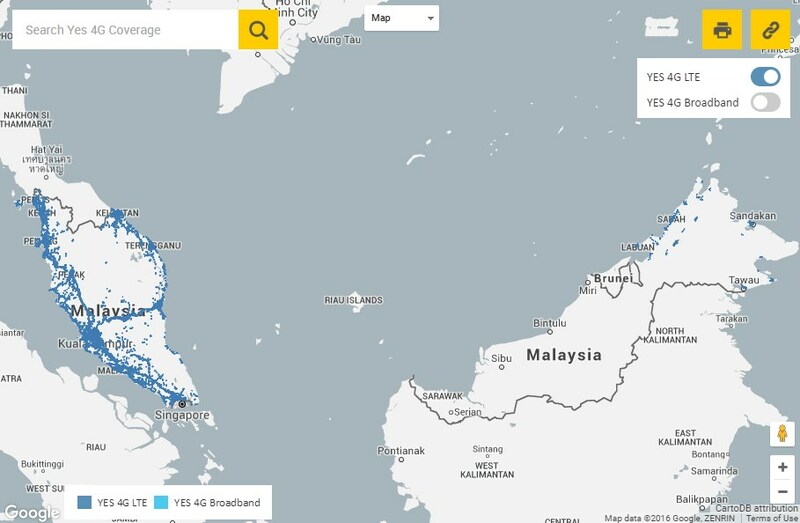 Yes 4G LTE’s coverage, as of 30 June 2016. 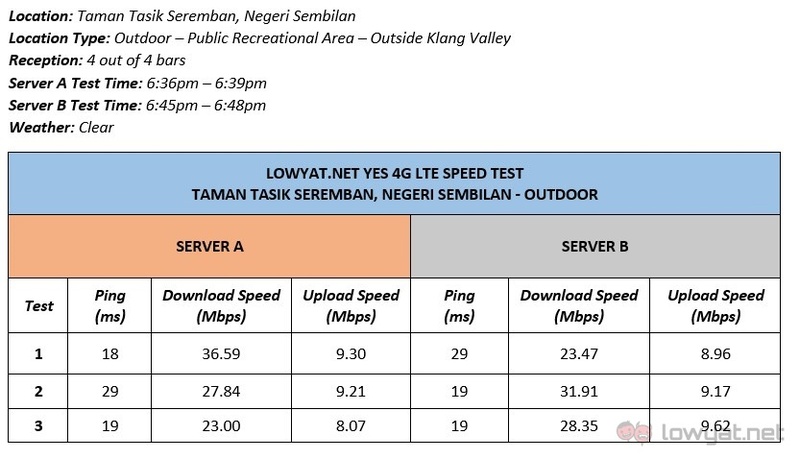 Since LTE is commonly associated with blazing fast Internet speed together with my intention to understand how LTE affects Yes 4G’s capability to serve its customers, I’ve performed several simple speed tests in Klang Valley and Negeri Sembilan. 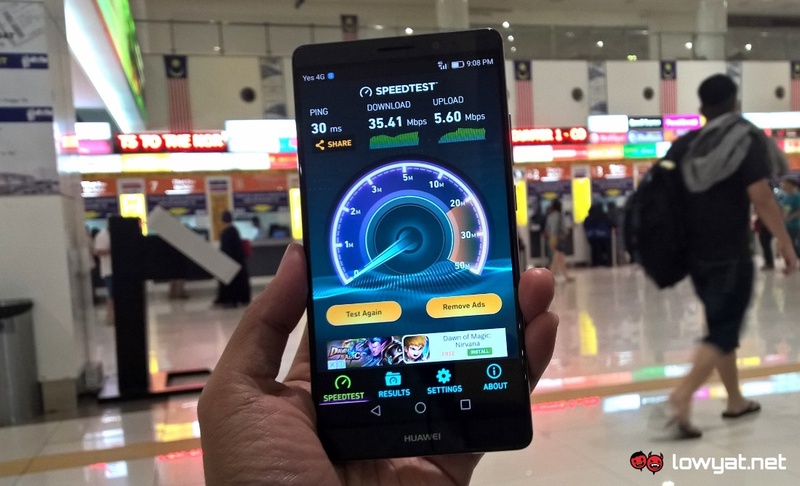 Huawei Mate 8 at Terminal Bersepadu Selatan, one of the speed test’s location. Paired together with a Yes 4G LTE prepaid SIM card, the device that I’ve chosen to utilize during these speed tests is a Huawei Mate 8. 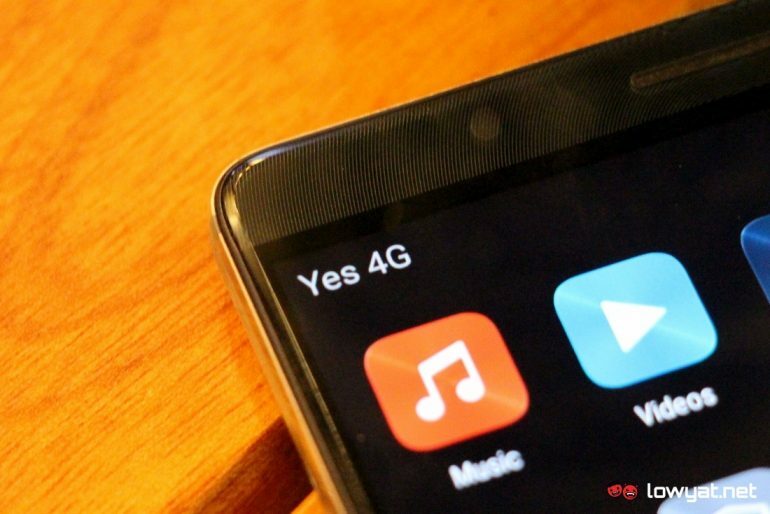 Even though the VoLTE function on the Mate 8 has not been activated at the moment and expected to take place in Q3 or Q4 this year according to Yes 4G staff at the launch event earlier this week, the data feature works without problem with Yes 4G LTE network. 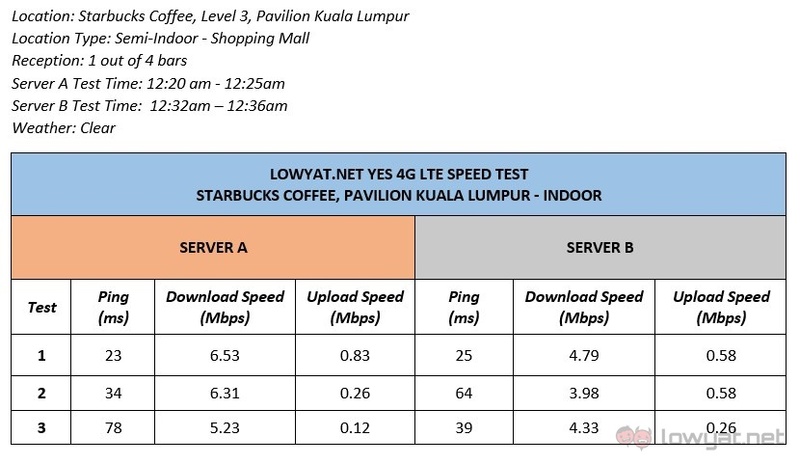 The speed tests were performed on two servers as listed by Ookla’s Speedtest app: Yes 4G and YTL Broadband, which are both located in Kuala Lumpur. 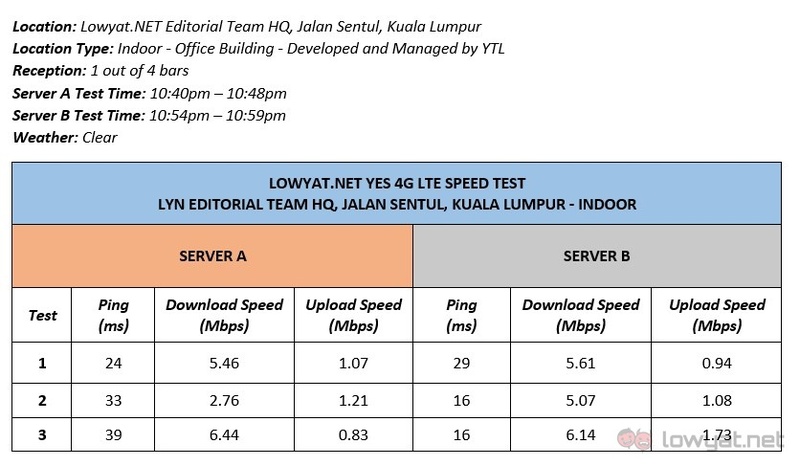 To judge the network consistencies, I performed three rounds of test for each server with one minute of gap* between each test as well as five minutes of gap* before moving from Yes 4G server to YTL Broadband. At the beginning of the test session in each location, I will also restart the Mate 8 so that a new IP number would be assigned to it. *unless network communication issue error pops up which would usually lengthen the gap. 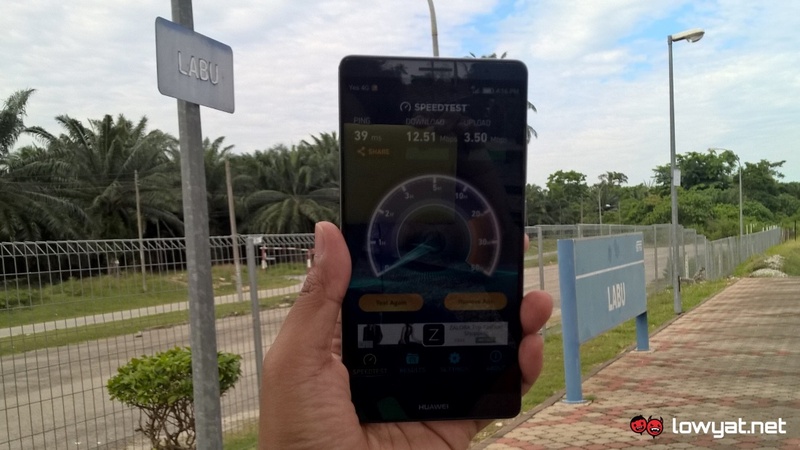 Yes 4G LTE speed test at Labu, Negeri Sembilan. 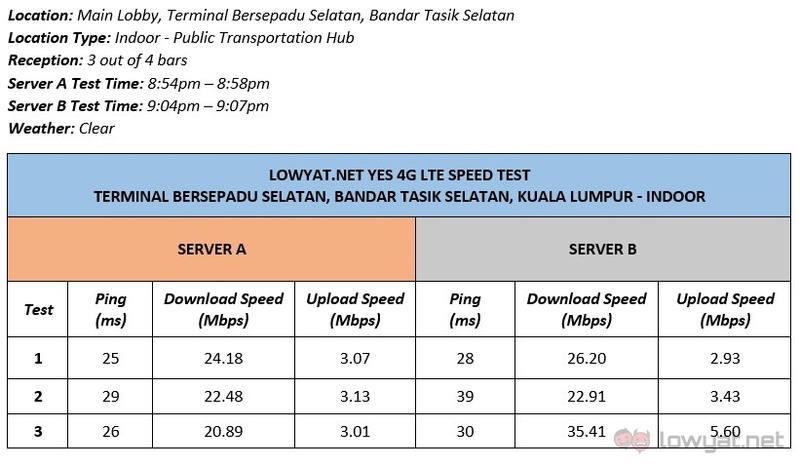 Based on these quick test sessions, I found that the speed of Yes 4G LTE were mostly quite consistent. However, the speed level varies from locations to locations with certain spots have way higher speed than others. We were informed that certain buildings that were developed and managed by YTL have been equipped with additional equipment to provide better experience but that is not always the case. 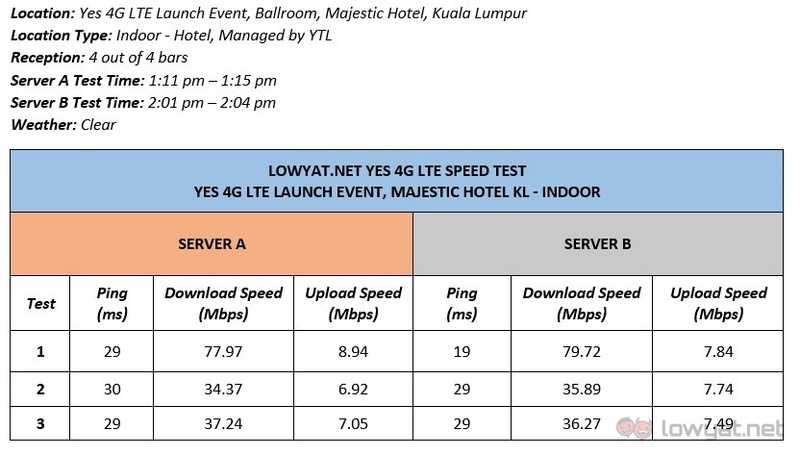 For example, the venue of the Yes 4G launch event few days ago – Majestic Hotel Kuala Lumpur – is managed by YTL which have good coverage and excellent network speed. 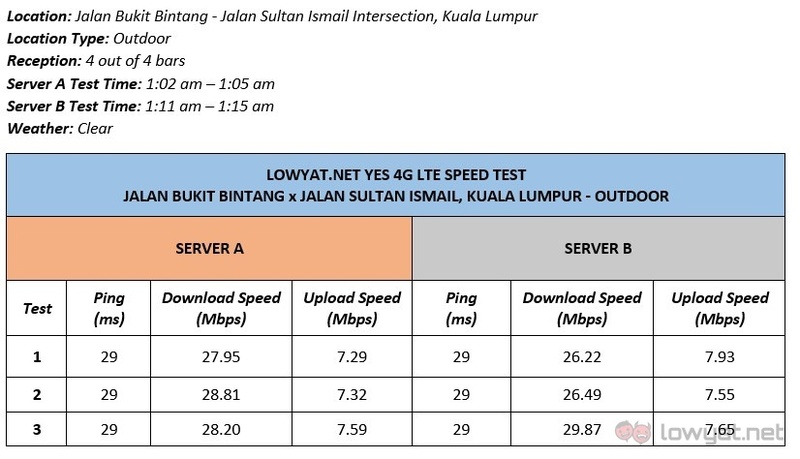 On another hand, I also achieved fantastic results at Terminal 1 Shopping Center in Seremban which is not related to YTL (as far as we know, that is). 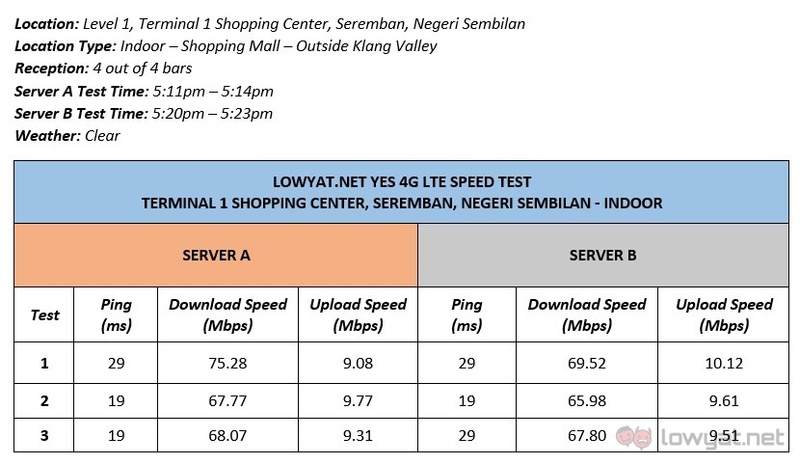 Strong result for Yes 4G LTE at Terminal 1 Shopping Center in Seremban, Negeri Sembilan. 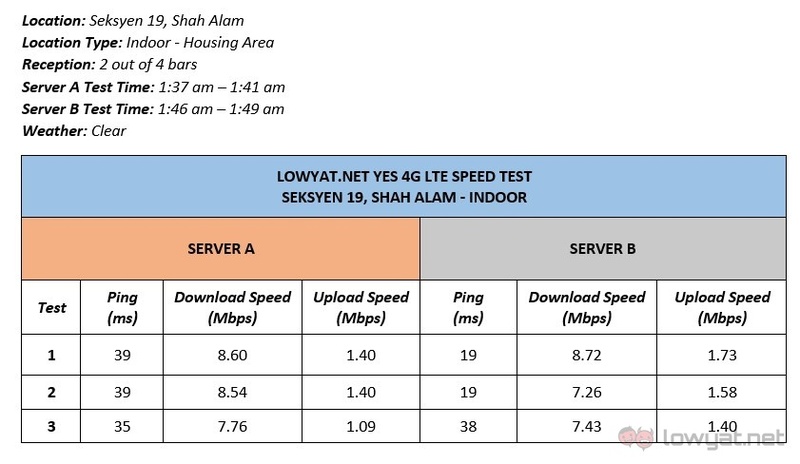 Meanwhile, the differences between download and upload speed on Yes 4G LTE network is rather huge although the actual ratio is not clearly defined. Interestingly, the network latency is generally quite good as the ping of the results were mostly under 50 ms. 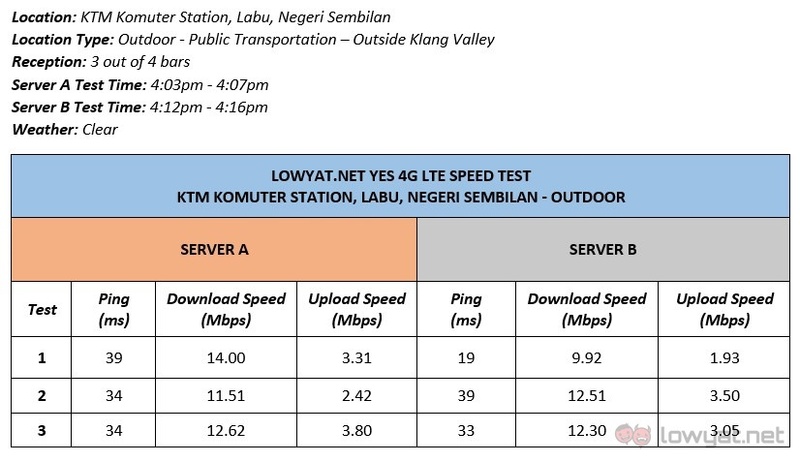 Even those that were not, the latency is still under 100 ms. All in all, it seems that the new LTE network has provided Yes 4G with improved performance as compared to its WiMAX network which churns out average download speed of 4 to 6 Mbps while maxed out at 20Mbps. One would certainly expect to see good performance at the launch event and Yes 4G LTE has certainly delivered it. Then again, let’s not forget that we are looking at a brand new network that is still deprived of users and that other part of the country might have different results. Once more users started to join the network, things might change though and that’s when the real challenge begins for Yes 4G’s new LTE network. What's it Like to Listen to a Pair of RM221,000 Headphones?